SharePoint 2019 Announced: The complete round-up from #msignite! My mind is still blown. As you might know, I have been doing some light Microsoft Ignite coverage the last few days via video. After seeing what I just saw, there’s no way I can convey all the awesomeness that Microsoft just announced about SharePoint and OneDrive. I couldn’t wait, so I’m sitting in the Expo hall right now writing this as fast as my fingers can move. 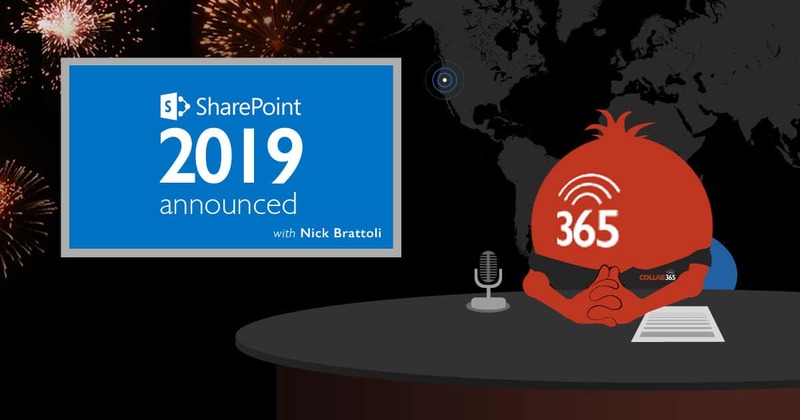 They brought all the greats on stage such as Dan Holme, Jeff Teper, Naomi Moneypenny, Chris McNulty, and more to announce and demonstrate the things that are coming down the pipeline for SharePoint, OneDrive, and even regular ol’ Office. Without further adieu, lets get started. It’s no secret that SharePoint and OneDrive are the same underlying technology, it’s only a difference of “my content” versus “our content. With these new announcements, they are blurring the lines even more. Files on demand are coming out in Octo​​​​ber! While this was announced a while ago, this heavily-requested feature is finally coming next month. You no longer have to lose access to your data by choosing to selectively sync them. You will be able to simply right-click your file, and choose whether or not to keep a local copy. You keep all your access, and your hard drive will thank you as well. This functionality will extend to your synced SharePoint Team Sites as well! Another previously-announced feature, you no longer have to open a browser or send an email to share your synced OneDrive and SharePoint files. Now you can simply right-click and select share, which will give you a secure url to send however you please. Speaking of URLs, SharePoint and OneDrive are not known for their short URLs. Microsoft realized this and will be releasing much shorter, pleasant looking URLS when you share your files. In addition to sharing straight from explorer, you are able to share your documents directly from whichever Office application you are using to create them! This functionality will be available in ALL versions of Office! No Microsoft account needed for sharing securely! With a new system that uses single-use security codes, you can now share your data with people using any kind of email service, and sleep easy knowing that they can’t share anything you don’t want them to. Ever wonder if anyone actually looks at the files you share with them? Wonder no more! You can now see who viewed your files. Since OneDrive and SharePoint are basically the same, all of these features of course apply to both. Pretty soon, you will be able to view 270+ different content types without needing the program they are associated with. These file types even include medical and 3d models! Do you like to keep your content secure, but still want people to be able to sync it locally? You will soon be able to sync your IRM enabled libraries with the OneDrive sync client and still enforce your configurations. There was no shortage of SharePoint-specific announcements either. In fact, there were so many that SharePoint looks like an entirely new entity. There were several new web parts announced that people have been asking about for a while. Microsoft Forms – place surveys directly on your pages! Planner – You no longer have to go to a separate app to view your relevant planner items. File previewer web part (270+ types) – That same file preview functionality that OneDrive is getting is getting it’s own web part so you can embed all kinds of things on your Team and Communication site pages. Activity web part – See what people in your organization are working on! Connector web part – Soon you will be able to connect to over 100 different data sources that can be displayed in your sites! Improved Yammer web part – Yammer is not dead, and Microsoft continues to make improvements to help it fit in better with rest of their collaboration apps. 3D file viewer web part – Interact with 3D models right on your pages! If you’ve used Teams and Groups, you can already see great potential. With these new improvements, things are going to get much better very soon. File Previews (again) – Just like with OneDrive and SharePoint, the new file preview functionality will exist within Teams. The SharePoint Mobile App is getting its share of improvements as well. Getting your content on the go is about to get much easier! Native mobile sites – The mobile experience is about to get a lot prettier with sites designed to natively fit your mobile device screens with very nice layouts. Bookmarking – Don’t have time to read a page right this second? Bookmark it for later and go to the new “Me” tab to see what you need to come back to, in addition to things you may have missed. Navigate to sites – Just like it sounds. You can view all of the sites you have access to, and they actually fit your phone and are readable! User adoption is going to be a lot easier to achieve with these new improvements coming down the pipeline. News Pages – Offering an easy way to create content, News pages are coming to both Team and Communication sites. Think wiki pages but easy enough to create that any of your users can make beautiful looking content. Web Search with Bing – Search outside your intranet with new integrated Bing web search. Side note, when Dan Holme demoed this, my ugly mug was in one of the result previews when he searched for Microsoft Ignite. It made my day. Promote Button – Share your pages with the world! Improved people cards – Microsoft’s acquisition of LinkedIn has suddenly started to make a lot of sense. Countless Information (I can’t count very high) about people in your organization, and the people above, below, and beside them will now show in the people cards (which can be embedded straight in your pages. Look and feel improvements – Remember how site templates went away (or at least the link was hidden)? That was for a reason. If you create and install custom themes, they will show up in the “look and feel” settings to quickly brand your sites. Streamlined custom site provisioning – The process to create a new site wasn’t too complicated to begin with, but now you don’t even have to go to site settings to do so. You can quickly provision new sites, based on your own custom configuration by clicking a button, selecting your options, and letting it do it’s thing. It will even create all the content for you! New “tool box” for web parts – Miss the old ribbon and web part gallery? You won’t anymore. Pop up a cool looking overlay and get whatever web parts you want. News Digest – Also self-explanatory. Roll up relevant news articles and get them when you need them. HUB SITES! – Navigation, themes, and content rollups have been a staple of my work for some time. I’ve created a whole lot of “top level” sites and done a bunch of trickery to roll up content from sites below over the years. With the new hub sites, you can create a new hub site or designate an existing one, and then connect ANY of your other sites to that hub site with one setting. Those sites will instantly inherit the navigation, look and feel, and the content and activity feeds will roll up into your hub site. A tear came to my eye when they announced this, and I’m a heartless monster. Custom forms with PowerApps – Yep, it’s time for PowerApps to finally put InfoPath out of my misery. Embed your apps straight into SharePoint. At its core, SharePoint is a collection of lists. Microsoft is about to make those lists so much better. Column formatting without custom code! – I am a terrible developer, and making your data color coded based on value has not been an easy task in the past. Fret no longer. No-code column formatting is coming! PowerBI and Bing maps in your list items – You didn’t read that wrong. You’ll be able to put PowerBI items and Bing Maps right in your list view forms, and even interact with them. No more paging! – I’ll say that again. NO MORE PAGING! As you scroll your list, you will continuously get the content as you go without needing to switch pages. This works even for gigantic lists due to the performance increases they were able to achieve with Azure. I love talking about Search, so this was one of my favorite parts of the presentation. There are quite a few things coming our way. Personalized search – We knew this has been coming, but now, when you click the search bar, you immediately see your most recent and relevant data before you even type a single character. Results page update – Search results will show up in very pretty cards, organized by content type. Live preview – We all like that we can see a preview of our content when we are searching, but with the live preview functionality you will be able to view any of those 270+ content types and interact with them without leaving your results page. Folder results – Another huge one, folders will show up in your results. Image search – Do you have to take pictures of receipts for expense reimbursement? If you upload them to SharePoint, you won’t even need to put in all that metadata to make it searchable. Search now sees the text in your image files! People results – You can see relevant files within the people cards, and even search further and filter right there! New SharePoint Admin Center – The new Admin center will be familiar, as it’s similar to the Office 365 admin center itself. It has graphs to show you your usage data, as well as messages that tell you which features have been added and removed from your specific tenant. Site management upgrade – Managing your SharePoint sites in Office 365 hasn’t always been the most pleasant experience. That’s about to change. Search for your sites, including your sites created by Groups/Teams that were previously invisible. You can also perform bulk actions such as groupifying your existing Team Sites. Site-level conditional access – Give your users access depending on which device they are currently using per site. They may eventually take that all the way down to item level. Compliance – Since different countries have different laws, organizations face many challenges when they are international. One of those challenges is about to be over though, as you will be able to determine which users reside in which geographical locations, and apply policies depending on where they are. Self-service OneDrive restore – Something get corrupted? With the new OneDrive restore capability, users will be able to get their data back all by themselves, reducing the risk of data loss, as well as the strain on your IT department. Migration tool – Quickly migrate your list and library items with the new lightweight migration tool. The usual Office Apps we all know and love are getting some improvements too. Co-authoring – Work on documents together in real time, complete with @mentions. Sharing on all platforms – I mentioned this earlier, but sharing will work the same no matter which platform you are using Office on. Office 2019 – It’s coming. This is the one you have been waiting for. SharePoint server 2019 is coming. Not much is known yet obviously, but we have much to look forward to. I’ll have to admit, I’ve lost some of my passion for SharePoint over the last couple years and have branched out further into the surrounding technologies. Microsoft is bringing everything back together in a big way, and our productivity will be better for it. SharePoint lives, and it’s gone from a (useful) monster to a polished dignitary. Are you coming to Collab365 Global Conference on Nov 1st? The ultimate introduction to Microsoft Flow and PowerApps!